That almost every family homeschooled. That every church discontinued its Sunday schools and youth groups. That every family practiced daily Bible reading and prayer. That every father led his household. That the churches were full every Sunday—full of dead man’s bones. The current efforts at uniting church and family upon a method instead of the Gospel can easily lead to this danger. This is especially the case in today’s climate of weak and confused Christians. 57% of confessing Evangelicals deny that Christ is the only way to heaven. Barna numbers suggest that being a homeschooler is no sure defense either: half of those polled believe that salvation is not by faith alone. And anecdotal evidence could be multiplied until the Second Coming. The American family today certainly needs instruction in the basics of family life: fatherly leadership, motherly responsibility, parental discernment and the like. But they need more. They need to understand the sinfulness of sin. That the Good News must first have bad news to make sense. That all their obedience, Bible reading and church attendance will not eradicate their wickedness before God. And while their hearts are pricked, they should be offered the Balm of Gilead. Not just any generic, Evangelical, warmed-over Deistic moralism, but the good-old fashioned, man-humbling and Christ-exalting Gospel. I have my own opinion that there is no such thing as preaching Christ and Him crucified, unless we preach what nowadays is called Calvinism. It is a nickname to call it Calvinism; Calvinism is the gospel, and nothing else. Uniting the church and family begins foremost with the Gospel. How can it be otherwise? Because the Gospel message is entrusted to the Church and not to the family, any Christian praying for revival and reformation must pray for the Church to be faithful. It is to the Church that God has given teaching, sacraments, prayer and discipline for the sanctification of the saints. It is to the Church, and the pastor in particular, that the ministry of reconciliation is given. This means the Church of God, the Bride of Christ, is the mother of all Christian families…and orphans, widows and singles (Gal. 4:26). The deacons should help take care of the poor and helpless. The ruling elders should govern in righteousness and humility. And the minister should faithfully preach and teach the whole counsel of God, especially the Gospel. The Church must be governed by Jesus Christ, through His Spirit and Word. The activities of the Church must be within the parameters of the Law of Christ. Public worship must be jealously guarded and carefully in line with the positive warrant of the Bible. All other activities—fellowship and teaching opportunities—must be exercised within the boundaries of glorious freedom found in Christ (Rom. 14:10). Even so, the family has its own sphere of responsibility. First and foremost, the head of the home needs to unite his family with a faithful church. Period. The parents must also unite in purpose: will the Gospel be the distinguishing truth in their family or some method? The children must see the parents take Christ’s message seriously. They must see the parents love the church of God. 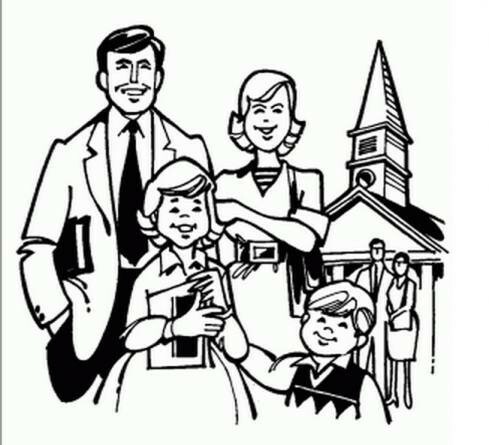 The whole family must faithfully attend the public means of grace, especially preaching. The parents must unite in practice: daily family worship is a must; catechetical instruction is important; loving discipline is necessary; parental involvement is demanded. And practical expressions of love and obedience should be the order of the day. This means prioritizing time and talents. The Christian Sabbath should order family time during the week. Tithing should order the finances. The time and money remaining should be used in order of importance with sports, clubs and the like at the bottom of the list—or eliminated if they crowd out the ever-important spiritual nurture required day in and day out (Deut. 6:7). The unity of church and family begins with the Gospel. But it does not end there. It is a unity of a family, where those who do the will of God are brother, sister and mother (Mk. 3:25). Biological ties may be severed by the Gospel (Mat. 10:34), yet those spiritually united to Christ will still have the Church as “the house of God, which is the Church of the living God, the pillar and ground of the truth” (1 Tim. 3:15). This should not be a pie-in-the-sky idea but a truth with practical consequences. For instance, in 1 Timothy 5:1, Paul commands Timothy not to rebuke the older men and women of the Church but to come alongside and entreat or exhort (parakalei) them as members of the family–even the younger among them. Likewise, in Titus 2:3-4 Paul commends the older women to be “teachers of good things” and to train and admonish the young women of the Church—whether married or not. If this is true for women, it is true for men (cp. Paul’s mentoring of Timothy). And if this is true for ad hoc situations, then it is true for more structured situations (cp. LCQ 99). The children of the Church, by virtue of their baptism, must be instructed by the Church (Mat. 28:20). The content is the entire Word of God. The goal is for God’s glory and the salvation of their souls. And the method–whatever details may be employed—must include someone mature because instruction is not only taught but caught. Naturally, this does not mean supplanting parental responsibility but supplementing their work and exercising the Church’s own responsibility toward her covenant members. Ideally, parents would feel comfortable with a trusted, godly brother or sister instructing their child. In practice, the older men may meet at a restaurant to talk about life while the younger men listen and learn. Those mothers strong in English could instruct a group of children in the fine points of grammar. Such variations are neigh endless. The members of the family of God must never lose sight of how much they can influence the covenant child by their example alone: do they show love to each other? are they ready to restore the weak? are they quick to acknowledge sin? The covenant child should know that whatever adult he is in contact with has the same expectations as his parents.